2-4 January, 't Mirnster Klif and De Mokkebank, Gaasterlân-Sleat, Friesland, adult (R Goldbach). Both records are considered to refer to the same bird. A new species for the Netherlands, accepted 27 years after it was observed. 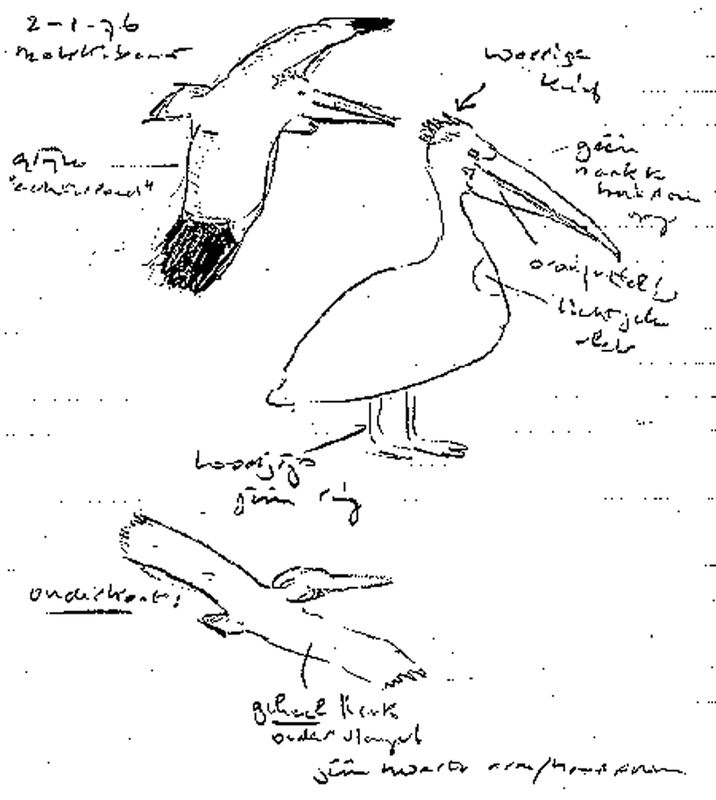 At the time, all observers considered all pelicans to be escapes. However, both pelican species breeding in Europe have good vagrancy potential and since Dalmatian Pelican is a vagrant to Hungary and Italy (Cramp & Simmons 1977), a wild origin is considered a realistic option (contra Cramp & Simmons 1977). Up to 19 centuries ago, the species was a breeding bird in the Netherlands (cf van den Berg & Bosman [Annual report 2002]. 1976 2-4 January, ‘t Mirnster Klif, Gaasterlân-Sleat, Friesland (R Goldbach, E Goldbach-van Hoorn), and 12 August to 5 September, Ventjagersplaat, Haringvliet, Korendijk/Oostflakkee, Zuid-Holland (H J M Baptist, H F van der Lee, G L Ouweneel), and 11 October, Hompelvoet, Grevelingen, Goedereede, Zuid-Holland (H J M Baptist, P L Meininger), and 18 October, Ventjagersplaat, Haringvliet (H J M Baptist, P L Meininger) and Kilhaven, Punt van Goeree, Goedereede, Zuid-Holland (H Middelkoop, K Mostert et al), and 20 October, Grevelingen, and 24 October, Ventjagersplaat, Haringvliet (H F van der Lee), adult [Annual report 2004].